Festo, a multinational group of companies with an engineering base. Festo has factories, distribution centres and sales locations in 61 countries across the world, including Germany and the United Kingdom. Festo is most known for their developments in pneumatic and electrical automation products as well as their progress in their research programme into advanced automation. One of the most notable projects was their AquaJelly project which explored superior movement and articulation in machines. Festo has created the AquaJelly as part of its ongoing research programme into advanced automation. Festo was initially founded in 1925 and has grown from manufacturing wood-cutting tools, most notably the first portable petrol chainsaw, to developing pneumatics and industrial products. Over the years as Festo grew, it diversified into the automation and manufacturing industry and is now a market leader in electrical and pneumatics drive and control technologies. Along the way, Festo has acquired many new locations, employees and product ranges as they develop their offering. Currently, Festo employs around 20,100 people across the globe with an annual turnover of over 3.1 billion euros. The business is still family owned, and their independent financial status allows the company to follow their path and commit to long-term projects. Festos philosophies are focused on industrial education, resource conservation and contributing to the overall quality of life. 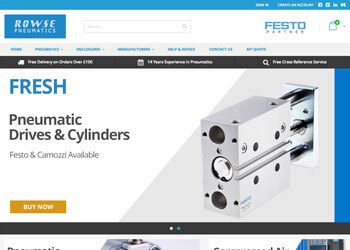 At Rowse, we have been a Festo Distributor for many years specialising in advanced pneumatics and electrical products. We have access to the vast Festo catalogue. We are a Festo Partner with many members of our team spending considerable time learning the product, how it works and how it can help you. Our teams regularly attend training events and conferences held by Festo to learn everything about their new developments and products.